Proficient software for NSF to PST Converter which helps to open NSF file and easily extract NSF data from Lotus Notes NSF to PST file. eSoftTools NSF Converter Software provides advanced features to convert unlimited size of Lotus Notes NSF file and save free NSF to PST, Notes Address book to VCF & CSV file and NSF Calendar to ICS file. Export Notes NSF Emails to PST, EML, EMLX, MSG, MBOX, vCard, HTML, CSV and ICS files. Convert Lotus Notes Address Book to Outlook: Smart technology driven NSF file conversion gives secure lotus notes address book converter to PST, MSG, CSV, vCard and HTML file. Convert Lotus Notes Calendar to Outlook: Very easy steps to export lotus notes calendar to Outlook PST, MSG and ICS file. Folder-wise Notes NSF conversion Facility: Export only required folders from Lotus Notes to Outlook PST and other formats. Lotus Notes Emails Preview The Live Preview panel clearly declares what data retrieve from NSF database. Preserve Original Structure Our NSF to PST free software never made any changes on original structure of NSF file during NSF to PST conversion. User-Interface: UI sections are more user-friendly, robust and interactive with new style of data representation and saving function. Demo version nsf to pst software recover nsf file and save 25 items from every folders. 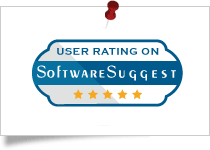 CNet awarded 5-star rating to eSoftTools NSF to PST Converter for its clean and safe recovery, migration and simple user interface. Read More..
eSoftTools NSF to PST Migration passed over 100+ antivirus & spyware, performed by SoftPedia and gives wonderful 100% cleanly award to eSoftTools NSF Converter Software.Read More..
Software Suggest recommended eSoftTools Notes to Outlook Migration for its unique and trustworthy migration from lotus notes to outlook.Read More..
eSoftTools NSF Converter tool is the highly suggested migration software for lotus notes by FinanceOnline for its best performance and 5 star rating by its users..Read More..
NSF file is the extension of Lotus Notes. Lotus Notes contains calendars, task, emails, contacts & journals etc. Free NSF to PST Converter software works, when users unable to open NSF file & need a solution to extract NSF file, recover NSF file & free convert NSF to PST completely. 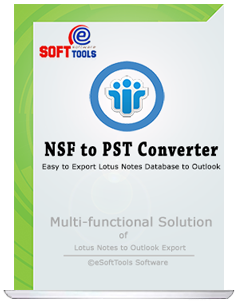 NSF File Converter gives multiple way to export lotus notes NSF to PST file, EML, MSG, HTML, EMLX, vCard, vCal, MBOX & other format. Every type of Lotus Notes Data can convert by Lotus Notes to PST conversion software like all emails, contacts, calendar, to-do items, journals, notes, email attachments. Download free NSF to PST converter software and fully migrate lotus notes nsf file without any restrictions. eSoftTools NSF to PST Converter tool gives you facility to recover NSF file and export lotus notes email attachment to PST file. Free NSF to PST Software can convert NSF to PST in healthy condition with preserve all database of NSF file in less time. Lotus Notes users can easy to recover NSF file & export lotus notes address book to Excel CSV and vCard(.vcf) format. After NSF recovery and previewing of items, user can choose the option "vCard (.vcf) either Excel "CSV" option and proceed the lotus notes address book conversion. So, with this software you can easy to manage Lotus Notes Contacts in Excel CSV either vCard VCF format. If you only need to export calendar from NSF file then this tool totally fits your need. This software has extra quick nsf calendar to ics conversion option to provide quick migration of lotus notes calendar to ics file. This is user's opportunity to see live preview of Lotus Notes items that contained all NSF file items and users can understand the recovery process and also know how NSF file conversion tool works successfully to convert lotus notes to outlook file with all emails, contacts, calendar, to-do list and other items. eSoftTools Export Lotus Notes to Outlook software is capable to recover and convert NSF file to PST file. It never changed any part of Lotus Notes Database NSF file structure and creates the same folder structure in converted Outlook PST file. Free NSF Converter to Outlook application is secure application to use and has the power to export NSF file in multiple formats like NSF to PST, NSF to EML and NSF to MSG, vCard, vCal, EMLX & MBOX file. Free NSF to PST file converter tool facilities export notes contacts to CSV file. Magnificent Free NSF to PST conversion solutions can make available with nsf export to pst for such a perfect option to choose long list of expanded tree items and easily select required NSF folder and convert nsf to pst file as save in to PST, EML, MSG, EMLX, HTML, vCard, vCal and MBOX format. The Demo/Trail version software works same as the full licensed version but the trail version has some restriction over migration phase. Users can save only first 25 items from each selected folders. Disk Space: Manage enough space to store recovered output data. NO MS Outlook installation required for NSF file coversion. Do i need to install MS Outlook installed on my computer before making actual conversion? No, MS Outlook installation is not required for NSF to PST Converter Software. Is Lotus Notes installation required for nsf conversion? Yes, The Lotus Notes installation is 100% required for successful migration from nsf to pst file. So users must ensure that Lotus Notes client installed on computer where nsf migration process executed. Will NSF to PST Converter Software preview all conversion process? Yes, you can! NSF to PST Converter software allowed you to preview your every NSF items before doing conversion. You can also get this feature in Demo version NSF to PST software. Can I try Free Demo version of NSF to PST Software? Yes, you can try free demo version of eSoftTools NSF to PST Converter Software, you can restore 25 items from every folder in PST, EML, EMLX, MBOX, vCard, vCal & more format. I feel like to export only Journal Folder from my lotus notes NSF file? Is it possible to export single folder? Yes, After recovery of Notes database, NSF to PST Converter Software lists all folders/ emails in tree structure. Click on the checkbox of "Journal Folder" and proceed to conversion. Do you provide any type offer with NSF to PST Converter Software? 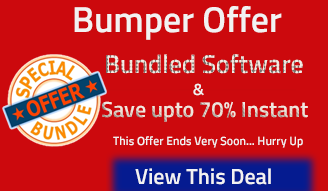 Here you can see all offers with bundled products. Its my good luck to used eSoftTools Free NSF to PST Converter Software that provided the conversion function very easy and flawless. I am happy after using your software and got satisfied result. First I evaluate demo version of eSoftTools NSF to PST Converter Software that completely convert 25 items (Limitation of demo version). Then i consider to buy and after that every restrictions are lifted and convert nsf file to pst file. Amazing experience. I would not have hesitation in suggesting eSofTools for any IT requirements needed. eSoftTools supports staff understand queries and they combined with clients in full passion to fix all types of errors and solve all problem. Well, I would like to thank eSoftTools for this wonderful NSF to PST converter tool. This tool really made my task of Lotus Notes migration easier and faster. And the results were accurate. Keep it up! I was not able to view the name of the contact while sending or receiving emails after NSF to Outlook conversion. Then I researched many methods to resolve it but all in vain. Then I came to the conclusion with this eSoftTools NSF to PST converter software to export my NSF contacts to CSV format. et Voila the problem is solved. Thanks, eSoftTools!